PROEVAL RAXMU Bird Monitoring Program focuses on bird studies in Mesoamerica, with an emphasis on Guatemala, including evaluation of local avifauna, the natural history of birds, evaluation of the status of threatened species, and identifying critical areas for conservation. The program helps to develop awareness towards nature conservation among local people and provides information for conservation projects. 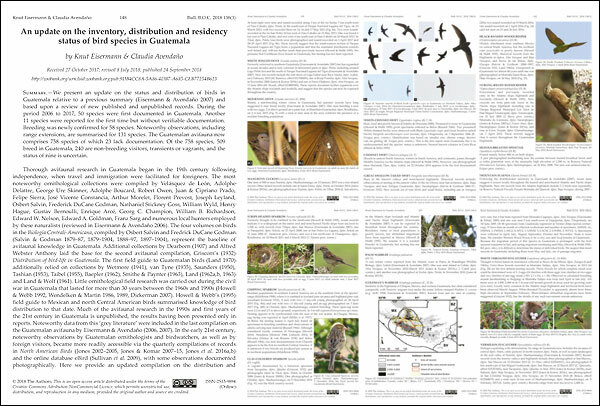 An update on the inventory, distribution and residency status of birds in Guatemala: Eisermann, K. & C. Avendaño (2018) An update on the inventory, distribution and residency status of bird species in Guatemala. Bulletin British Ornithologists' Club 138: 148-229. Contribution to the taxonomy of Resplendent Quetzal: Schulz, U. & K. Eisermann (2017) Morphometric differentiation between subspecies of Resplendent Quetzal (Pharomachrus mocinno mocinno and P. m. costaricensis) based on male uppertail-coverts. Bulletin of the British Ornithologists' Club 137: 287-291. Contribution to the herpetology of Guatemala: Eisermann, K. (2017) A new locality and elevational range extension for Rhinophrynus dorsalis Duméril & Bibron, 1841 (Anura: Rhinophrynidae), and a noteworthy record for Hypopachus variolosus (Cope, 1866) (Anura: Microhylidae) in Guatemala. Mesoamerican Herpetology 4: 688-692. Assess the status of threatened species. Assess the distribution of local avifauna. Study the natural history of bird species. Identify critical areas for conservation. Assess long-term bird population changes. Build local capacity and provide public education. Shorebirds on the Guatemalan Atlantic coast (Eisermann 2009). Avifauna of the high-elevation cloud forest at Montaña Caquipec, Alta Verapaz, Guatemala (Eisermann & Schulz 2002, 2005). 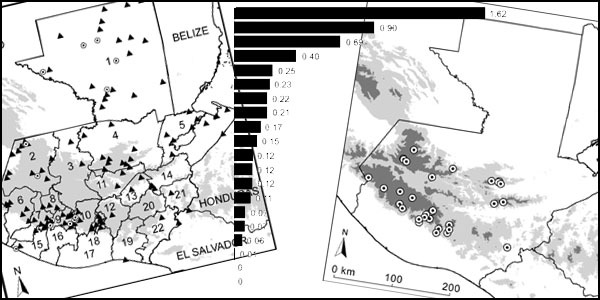 Several smaller contributions to the knowledge of bird distribution in Guatemala, such as hawk migration (Heinrichs et al. 2006), Crested Eagle Morphnus guianensis in Tikal (Grijalva & Eisermann 2006), noteworthy bird records in Alta Verapaz (Eisermann 2005b), American White Pelican Pelecanus erythrorhynchos in interior Guatemala (Eisermann & Avendaño 2004), noteworthy records from Punta de Manabique (Eisermann 2003c), and others. 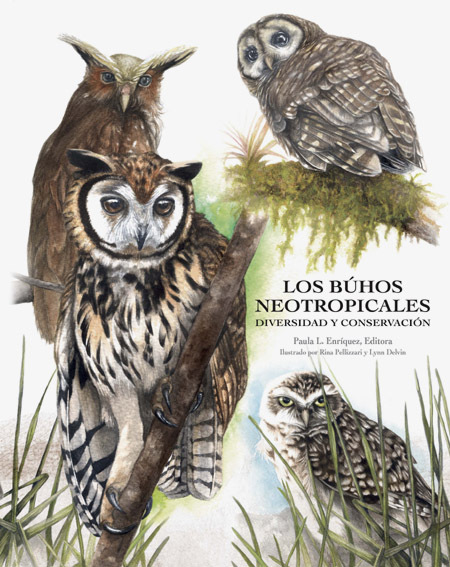 The project director served as the country coordinator to compile noteworthy bird records from Guatemala published in North American Birds from 2004 to 2015, and as editor of eBird Guatemala from 2008 to 2015. Nesting of Horned Guan at Atitlán volcano (Eisermann et al. 2007). Noteworthy nesting records of several species, including the first nesting record for the Azure-hooded Jay Cyanolyca cucullata in Guatemala (Eisermann & Brooks 2006). Coloration anomaly in the Collared Trogon Trogon collaris (Eisermann & Omland 2007). Indication of altitudinal migration of Slate-colored Solitaire Myadestes unicolor and Common Bush-Tanager Chlorospingus ophthalmicus in the Montaña Sacranix (Eisermann 2005). Foliage-bathing behavior of an Orange-breasted Falcon Falco deiroleucus (Eisermann 2005a). Bearded Screech-Owl Megascops barbarus (Vulnerable). 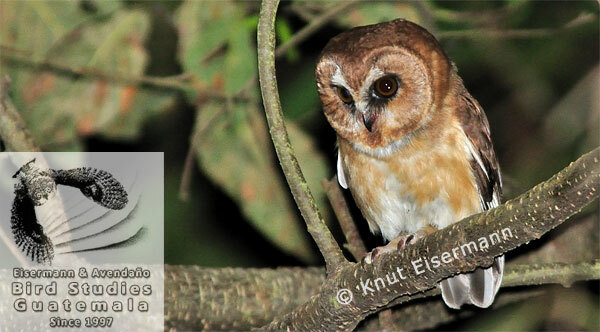 Evaluation of the status of the Bearded Screech-Owl Megascops barbarus which led to the species being upgraded from Near Threatened to Vulnerable on the BirdLife/IUCN Red List of globally threatened bird species in 2012. Evaluation of the tatus and recent sightings of the Ocellated Quail Cyrtonyx ocellatus (Eitniear & Eisermann 2009). Evaluation of the status of the Highland Guan Penelopina nigra (Eisermann et al. 2006); the Great Curassow Crax rubra in Punta de Manabique, Izabal, Guatemala (Eisermann 2004); and the Yellow-headed Parrot Amazona oratrix on the Guatemalan Atlantic coast (Eisermann 2003 a, b). Contributions to IUCN/BirdLife International's Red List assessments of the Highland Guan, Horned Guan Oreophasis derbianus, Ocellated Quail, Yellow-headed Parrot, Keel-billed Motmot Electron carinatum, Pink-headed Warbler Cardellina versicolor, Azure-rumped Tanager, Bearded Screech-Owl, and Belted Flycatcher Xenotriccus callizonus. 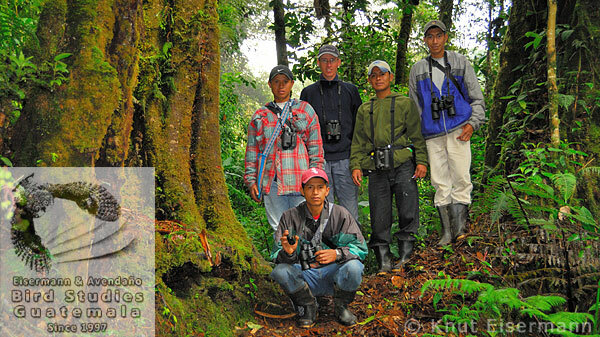 Research team of PROEVAL RAXMU Bird Monitoring Program in the cloud forest of Montaña Yalijux. The program regulary publishes in non-technical popular magazines (Eisermann 2003b, 2007a,b, 2008, 2010, 2011a,c, Eisermann & Avendaño 2009c, Howell & Eisermann 2011, Schulz & Eisermann 2001). Eisermann, K. & C. Avendaño (2015) Los búhos de Guatemala. 381-434 in P. L. Enríquez (ed.) Los búhos neotropicales: diversidad y conservación. ECOSUR, San Cristóbal de las Casas, Chiapas, México. Eisermann, K. & C. Avendaño (2007) Lista comentada de las aves de Guatemala - Annotated checklist of the birds of Guatemala. Lynx Edicions, Barcelona, Spain. 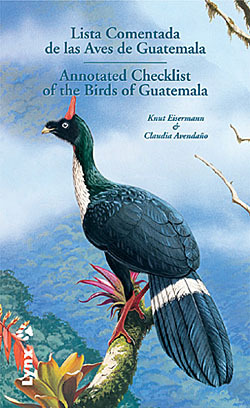 Eisermann, K. & C. Avendaño (2006) Diversidad de aves en Guatemala, con una lista bibliográfica. Pp. 525-623 In: E. Cano (ed.) 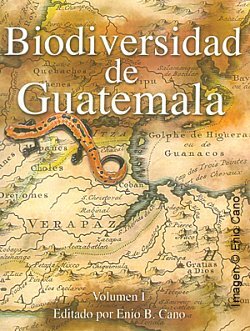 Biodiversidad de Guatemala, Vol. 1. Universidad del Valle de Guatemala, Guatemala. 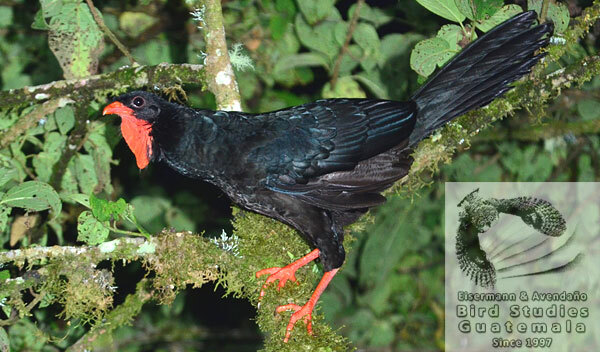 Eisermann, K., N. Herrera & O. Komar (2006) Highland Guan (Penelopina nigra). Pp. 85-90 In: D. M. Brooks (ed.) 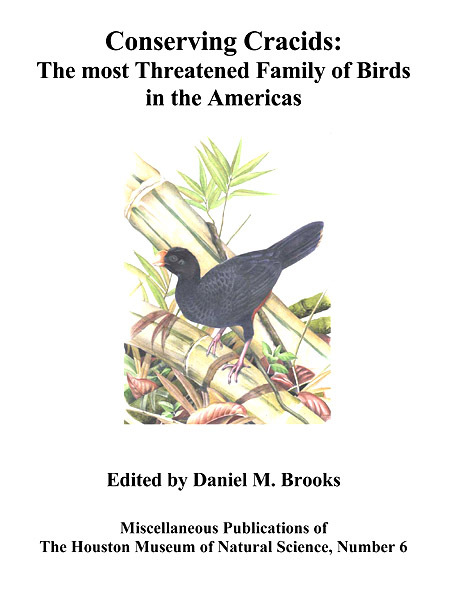 Conserving Cracids: the most threatened family of birds in the Americas. Miscellaneous Publications of the Houston Museum of Natural Science 6.